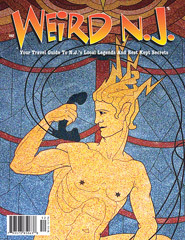 Hit the Road and Go “Weirding” Today with the WEIRD NJ iPhone/iPod Touch App! For the first time ever you can hit the road with your iPhone/iPod touch and travel to the Garden State’s strangest and most bizarre attractions. 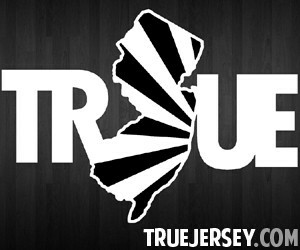 The App guides you to New Jersey’s local legends and best kept secrets. 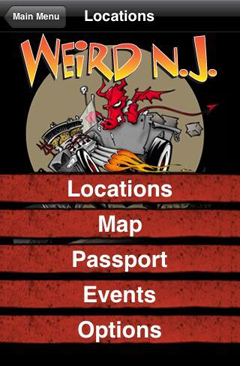 The WEIRD NJ iPhone/iPod touch Apps let you find the nearest weirdness around you, and allows you to browse through dozens of weird categories and locations including Shades of Death Road, Lucy the Elephant, The Jersey Devil, and many many more! 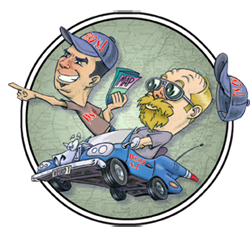 With the GPS feature, get driving directions to navigate directly to the most infamous cemeteries, apparitions, haunted dwellings, fabled places, and roadside oddities. Photograph and mark the location of your own weird discoveries then upload your findings directly to Weird NJ for possible inclusion in upcoming issues. We get a lot of requests from our fans asking for help finding many of the places listed in our magazines and books. Now they have a unique way to get directions, new locations, and stay connected with us through their iPhone or iPod touch. Social networking features allow you to create weird postcards and send them via email, Facebook and Twitter, get alerts for newly discovered weirdness, and stay connected with Weird N.J. news and upcoming events. You can even collect Weird Passport Stamps automatically for all the places you actually visit! Download and collect all the Weird NJ Apps at the Apple iTunes Store and stay informed on all the weird and memorable destinations the Garden State has to offer. Download your NOW! This entry was posted in Digital Media and tagged App, directions, GPS, interactive, locations, map, sites. Bookmark the permalink.